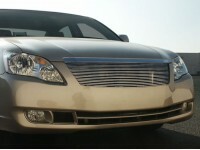 T85140A: 06-07 Toyota Avalon Replacement Billet Grille. This polished billet grille has an approximate installation time of about 1/2hr and replaces the existing OE factory grille. It comes with complete directions and hardware. Backed by manufacturers one year warranty. Imported.